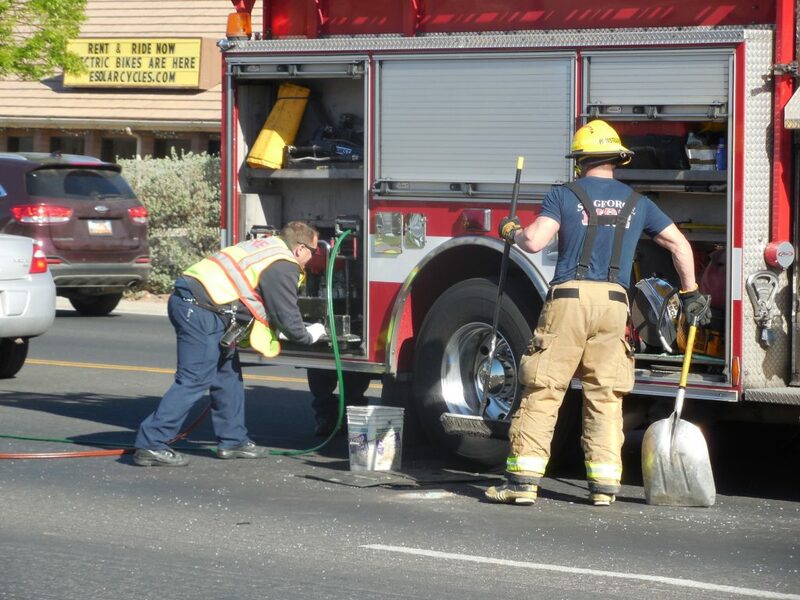 ST. GEORGE – One driver’s act of kindness and another’s failure to yield led to a two-vehicle crash Tuesday morning, police said. 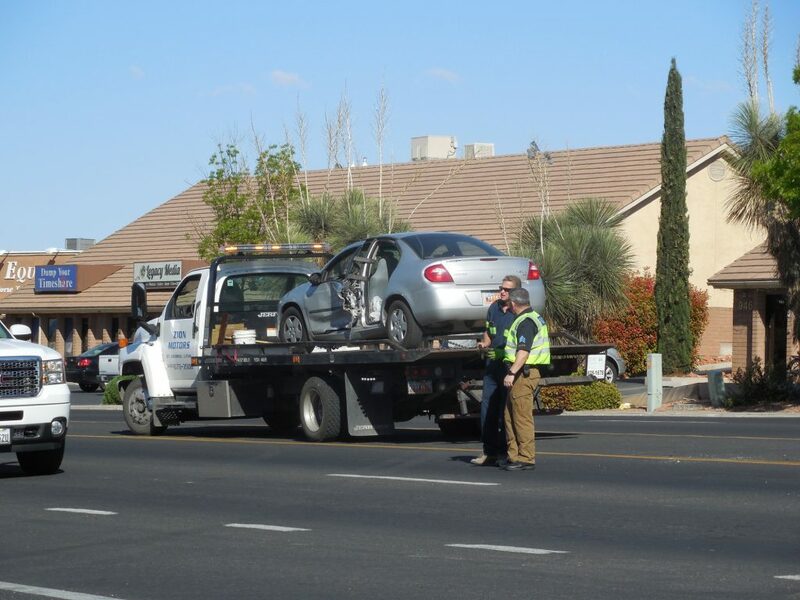 First responders were dispatched to an incident on Sunset Boulevard west of the intersection with Valley View Drive just before 10 a.m.
A 27-year-old woman driving a silver Dodge Neon was waiting to make a left turn out of the Phoenix Plaza parking lot onto Sunset Boulevard, St. George Police Sargent Craig Harding said. 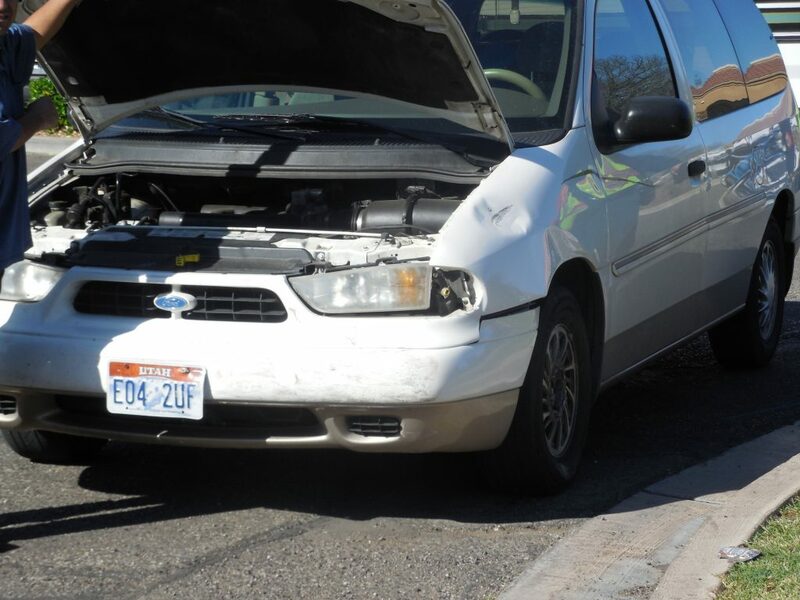 As the Neon pulled across the eastbound lanes of Sunset, it was struck by a white Ford van driven by a man in his 40s. This type of accident is common, Harding said, adding that it’s important for drivers to clear each lane as they come out of a parking lot. 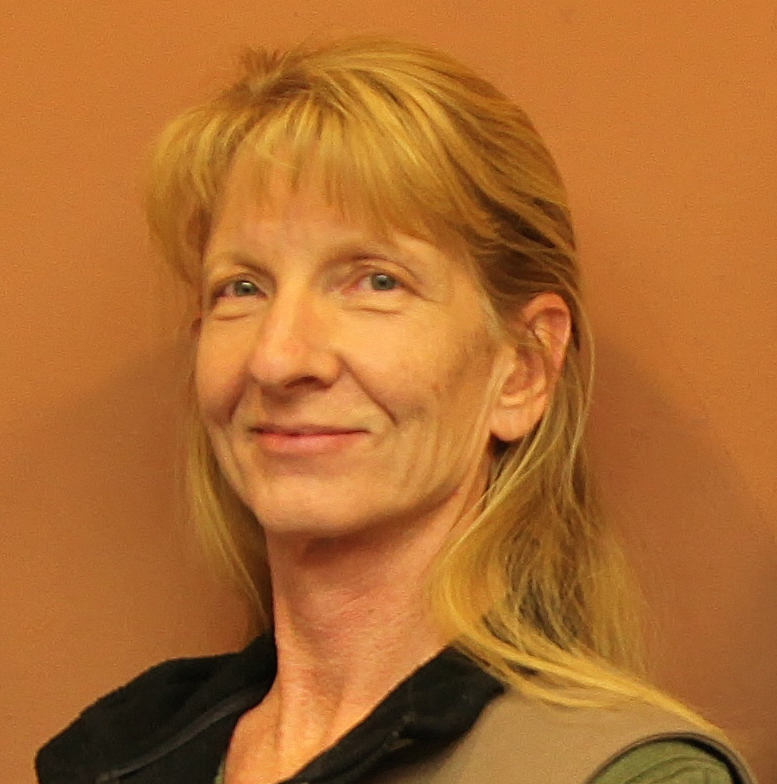 “Just because the person in the first one (vehicle) stops and yields to you doesn’t mean it’s safe to go all the way across multiple lanes,” Harding said. The driver of the Neon was transported to Dixie Regional Medical Center by Gold Cross Ambulance for treatment of bruises and abrasions. The driver of the Neon will be cited for failure to yield, the No. 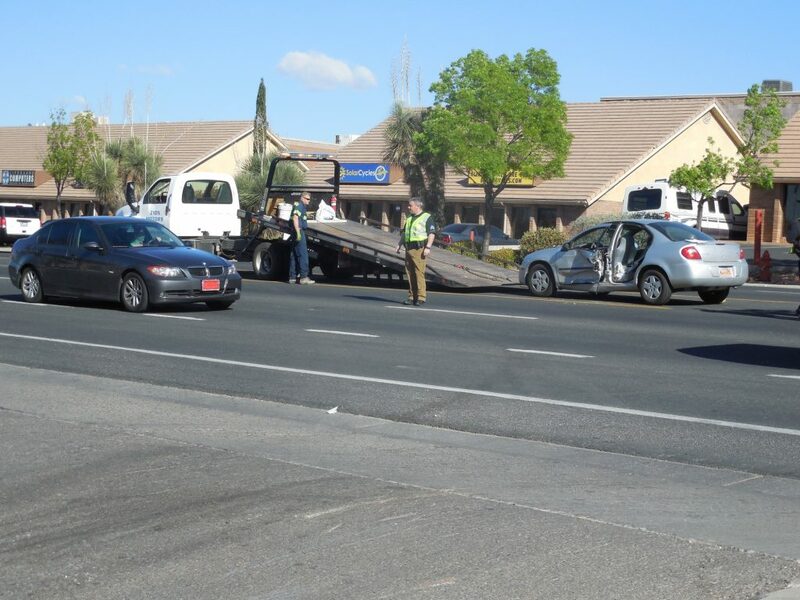 1 reason for crashes in St. George, Harding said. 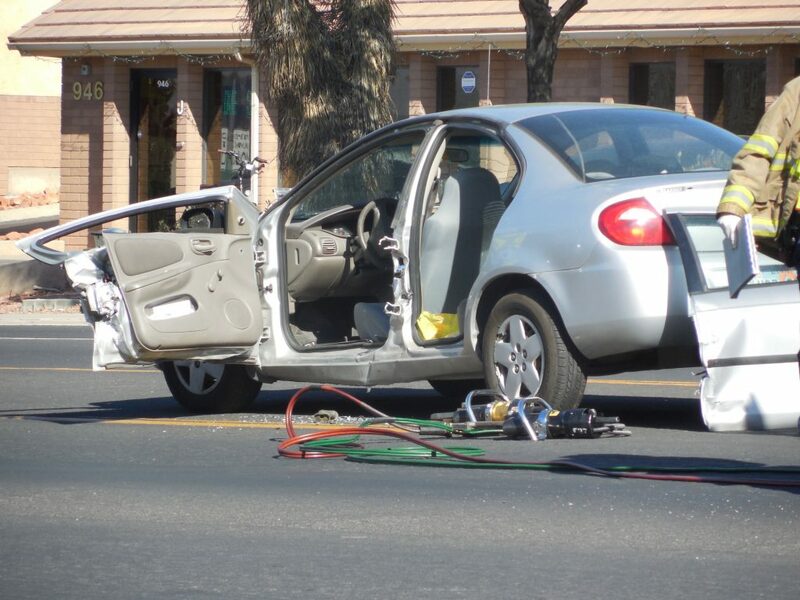 “This is what this is, failing to yield because someone (else) had the right-of-way,” he said. The Neon was towed from the scene. The Ford was driven out of the roadway. 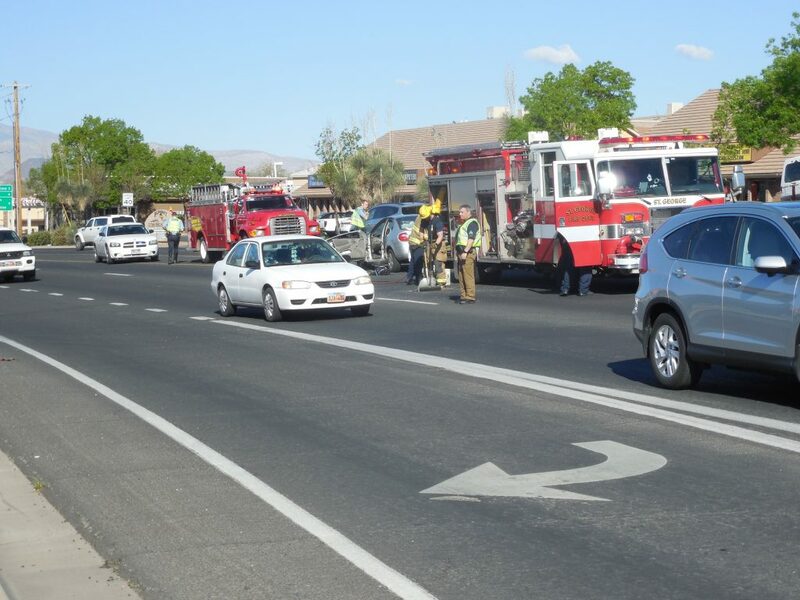 Gold Cross Ambulance, St. George Fire Department and St. George Police Department responded to the incident. Don’t drive kindly, drive correctly. Unless you are willing to get out of your car and direct traffic don’t stop on a four lane road to let someone cross, especially a pedestrian. The person who caused this crash was the one who was trying to be nice. Unfortunately, the lady in the Neon did exactly what so many people do. She depended on someone else to decide when it was safe to proceed. That center is a real mess to enter or exit, if you want to make a left turn. Hey St. George, how about a signal there? It’s worked very well on Red Cliff Dr. between the two shopping malls. There is a light there. You’re exactly right, Rainbow Dash. We go past that location all the time. This person tried to make a left turn from the North side of the parking lot, across east-bound Sunset Boulevard traffic, with no traffic light. If the person had gone to the East side of the parking lot, they could do a left turn onto Valley View Drive (and across much less traffic). It’s then 40-50 feet to the intersection of Valley View and Sunset. There’s a traffic light with a protected green arrow for a left turn onto west-bound Sunset. The change that should be made is to put a “no left turn” sign where this person tried to make their left turn. Actually, the light is at the intersection of Sunset & Valley View. However, about 400 feet west of the light, is a driveway into and out of Phoenix Plaza. That was where I was suggesting the light. As a matter of fact, practically the same situation exists at the Albertson’s center on Sunset at Dixie Dr. There is enough distance between the current signal controlled intersection, and the west driveway to warrant a light. No, there really isn’t enough room for a light. Put a traffic light at both of these locations like you have suggested and it will end up just like the congested mess that is the Exit 10 Underpass in Washington. You’ve got 3 lights: Green Springs & Red Hills Pkwy, Green Springs and the I-15 on-ramps/off-ramps and going under the freeway, and you’ve got Green Springs and Telegraph/Red Cliffs Dr. That is 3 separate and very busy intersections all within just over 1000 ft. There’s plenty of traffic lights in the this area. People just need to be more patient and wait their turn. Stop being in such a rush all the time. It is nice when people can be aware of others around them and not only think of themselves. When it’s clustered and possibly at a stop light, be considerate that others might be attempting left hand turns. With that said I’m sure the white Ford van never saw the car, some how.. It is nice when people can be aware of others around them and not only think of themselves. When it’s clustered and possibly at a stop light, be considerate that others might be attempting left hand turns. With that said I’m sure the white Ford van never saw the car, some how didn’t notice a large gap between cars, hmmm..
Lot’s of reasons for failure to yield, some more valid than others. It is obvious St George needs to take a hard look at traffic issues and make needed improvements knowing the developers will have their way leading to a lot more cars on the road — everyday. it was a lot Less aggravation to just exit on Valley View & make the left turn onto Sunset from the stop light . Make the crazy turns impossible with raised medians . I second the raised medians, super idea =). Medians are a great idea, but with a caveat. The issue with medians is the tall fancy trees that the city insists on putting in. It makes it very difficult for people to clearly see all 4 lanes of traffic when trying to turn onto St. George Blvd from a non-controlled side street (no traffic light). Most people end waiting for cross traffic closest to them to clear and then pull into the middle of the intersection and wait again, usually with half of their vehicle sticking out into a travel lane. I feel that people should be forced to turn right and then make a U-turn at the next controlled intersection.